Join us for a Christmas Holiday in NYC! | Oh, the Places We See . . .
Join us for a Christmas Holiday in NYC! 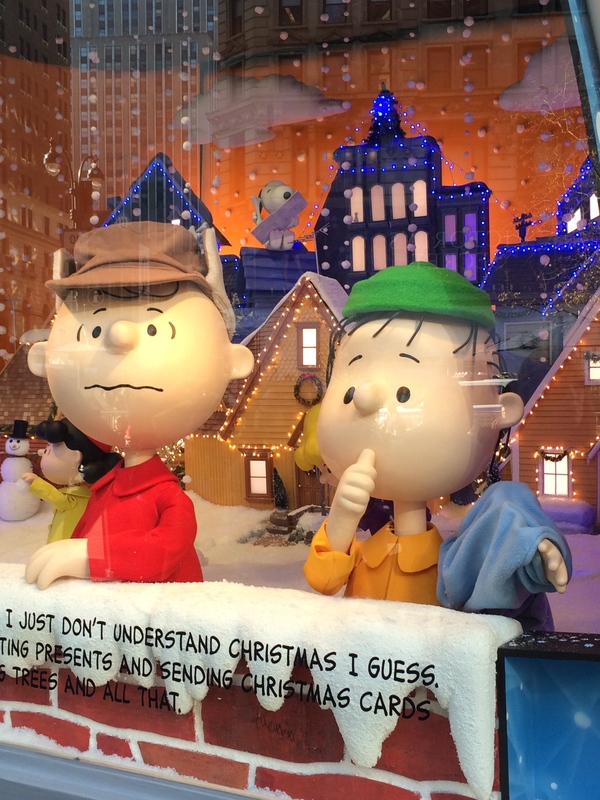 It’s the Peanuts kids in Macy’s NYC windows, charming everyone who stopped by to enjoy the season with them. If you’ve always worked in December, as we have, and wished for a respite from your end-of-year demands, consider this: Someday you may be retired with a chance to enjoy holiday travel. And that would be us. After almost 50 years of never taking a vacation during one of the most hectic months of the year, we dropped everything to take a spur-of-the-moment mini-trip to a city that oozes holiday spirit like no other: New York City! 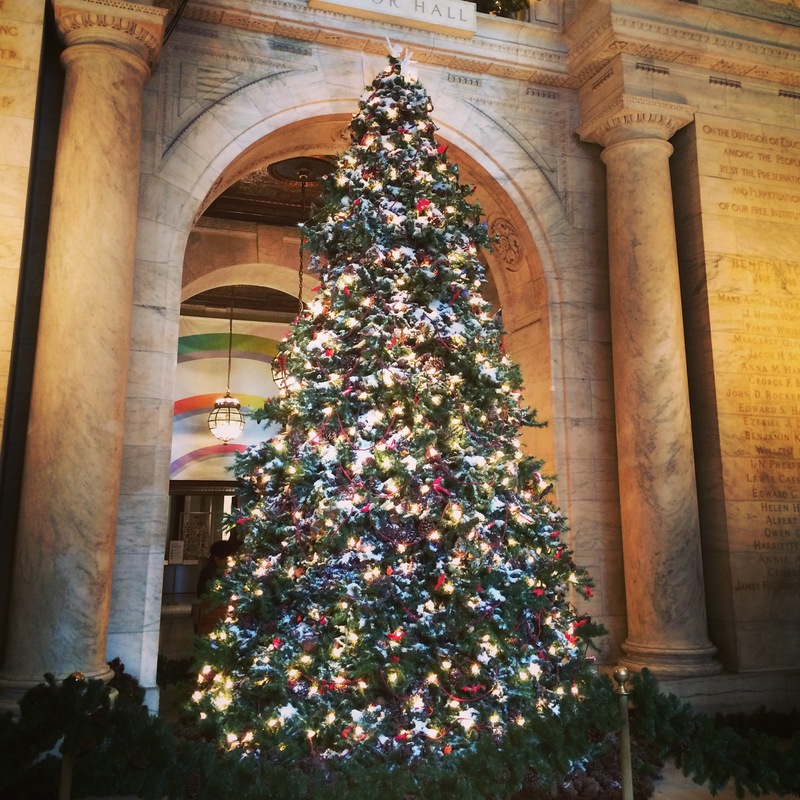 One of the most elegant trees in NYC — at the Public Library! So, for the next few days, we’re adding a few pics to our blog. And we’re trying something new. Not much copy. Short and sweet. Pics taken on the fly with a handy iPhone. Here’s hoping you’ll enjoy seeing The Big Apple through our eyes under the heading Travel Series: Christmas Holiday NYC. 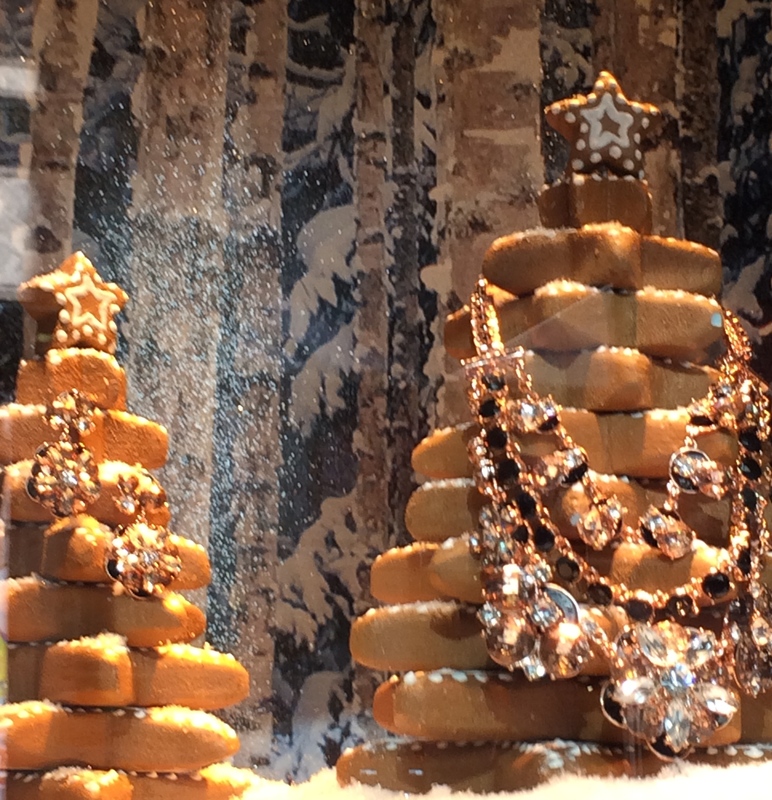 Gingerbread trees dripping with jewels — the windows at Lord & Taylor, NYC. Please feel free to chime in. If you’ve been to NYC or find something that reminds you of what you’ve seen, we’d love to hear from you. This entry was posted in Travel and tagged Christmas 2015, Lord & Taylor, Macy's, New York City, New York Public Library, peanuts. Bookmark the permalink. 15 Responses to Join us for a Christmas Holiday in NYC! Thanks, Melissa! I think I’ve got one more to come — just can’t think of a title! Appreciate the visit and title! It’s our pleasure to take anyone who’s interested along for the ride. We live in a great world filled with much to see. Happy holidays! I’ve been to NYC 14 times, not once during the holidays. I definitely want to do that. I’m enjoying your pics. I wish I could say I’ve been to NYC 14 times! Love the city and the heartbeat of all that’s going on. Thanks for taking a look at our blog. And best wishes for a very merry holiday season! Thanks for joining us on this journey, Susan. Best wishes to you for happy holidays no matter where you are! Without question, NYC is one of the very best places to visit during the Christmas season. We totally agree. In fact, I would go again next year. Thanks for taking a look. We’ve got more coming up! Me, too, Laura! But, of course, I’m behind in shopping, wrapping, and addressing Christmas cards. Sigh.